Day-care surgery has become a popular modality of surgical intervention throughout the globe. Numerous factors including the economic and financial issues are driving this therapeutic modality to a widespread acceptance among surgeons and anesthesiologists. Advancements in anesthesia and surgical techniques as well as availability of newer drugs are largely responsible for the progress of day-care surgeries. Numerous challenges are still faced by anesthesiologists and surgeons in carrying out day-care surgeries, especially in spite of these advancements, at resource-limited setups. The first right step in successfully delivering the day-care surgical services includes proper selection of the patients. The preanesthetic evaluation is highly essential in determining the suitability of the patient for day-care anesthesia and surgery as well as the formulation of various anesthetic plans and strategies. The current review is intended to highlight inherent challenges and probable solutions to them for this rapidly progressing anesthesia. Background and Objective: Lymph node lesions form a wide range of spectrum, exhibiting manifestations in both hematopoietic tissue and lympho reticular system. It is necessary to document the same spectrum in a particular region to understand the trend and diseases occurring frequently in that region. The range encompasses benign reactive changes to frank malignant lymphoma and metastatic deposits. Histopathology is considered to be the gold standard and its relevance to clinical diagnosis is studied here. Materials and Methods: A total of 200 cases were studied retrospectively in this study. Samples received were either biopsy or node resection specimens, and clinical history was recorded for each of them. Immunohistochemistry and special stains were performed as and when required. Results: Clinical diagnosis had a diagnostic accuracy of 71% approximately using histopathology as the gold standard. Most of the benign diseases were either reactive or tubercular lymphadenitis, whereas non-Hodgkin Follicular lymphoma had the maximum incidence among lymphomas. Conclusion: This study concluded that cervical group of superficial lymph nodes are most frequently encountered as palpable nodal swellings. The clinical suspicion of malignancy remains high in most of the cases due to the matted and enlarged presentation of lymph nodes. Histopathology revealed that only 33.5% of the cases to be malignant of which the most common was Follicular Lymphoma (non-Hodgkin type). The clinical accuracy of diagnosing malignant lesions thus coming to 71% approximately. Context: As per United Network for Organ Sharing, there are over 71,000 people on organ transplant waiting list in the United States. The only way to increase organ donations is to educate the health-care professionals and public about the importance of becoming an organ donor. One of the ways to start this is to promote the awareness of the college students, especially those in the medical field, toward organ donation as they are the most suitable persons to carry the message to the community. Aims: This study aims to determine the knowledge of medical students regarding organ donation. 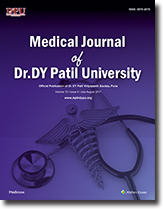 Settings and Design: Cross-sectional study conducted in a medical college of Western Maharashtra. Subjects and Methods: A questionnaire adapted to the study requirements from the published research was designed to capture the knowledge toward organ donation. Final year MBBS students who gave verbal consent to the study were included. Statistical Analysis Used: Microsoft Excel and SPSS version 20. Results: 87% of the students had correct knowledge regarding brain death occurring after road traffic accident. Fifty-four percent (54.45%) of students were not aware that an individual suffering from infectious disease cannot donate organs. 61% of the students were not aware that a National network for organ donation exists in their city. 48.5% of students did not know how to register oneself as an organ donor. Conclusions: The results of the study revealed that there exists a knowledge gap among the medical students regarding organ donation and there is an urgent need for addressing this knowledge gap which will help in improving the organ donation rate in our country. Introduction: Vitamin D deficiency is one of the major health problems globally, and the role of Vitamin D as an immunomodulator has been recently emphasized. There is increasing evidence to suggest that Vitamin D plays a significant role in reducing the incidence of autoimmune diseases. However, at present, its role in autoimmune thyroid disease is not conclusive. Hence, in our study, we aimed to examine the relationship between thyroid peroxidase antibodies (TPOAbs) and Vitamin D deficiency in the hypothyroid patient. Subjects and Methods: One hundred and four known hypothyroid patients not on Vitamin D supplementation were included in the study. They were divided into two groups with TPOAb positive and TPOAb negative, and serum 25(OH) Vitamin D3 (25[OH] D3) was measured and compared in two groups. Thyroid hormones (TSH and T4) were also evaluated in all patients. Results: Serum 25(OH)D3 was significantly lower in TPOAb-positive patients than in TPOAb-negative patients with P = 0.038. Mean serum TSH was significantly high in TPOAb-positive hypothyroid patients than in TPOAb-negative patients with P = 0.047. Conclusion: Our study shows that patients with TPOAb positivity have more significant 25(OH)D3 deficiency and uncontrolled hypothyroidism. Our study encourages the advisability of screening for Vitamin D deficiency for all hypothyroid patients and 25(OH)D3 supplementation. Background: According to the WHO, rabies incidence in India has been constant for a decade, without any obvious declining trend. It has been seen that there is a lack of awareness among health professionals about animal bite management. Therefore, for success of National Rabies control programs, it is of utmost importance to assess their training needs. Objectives: The objective of this study was to assess knowledge and practice regarding animal bite management among resident doctors of the Government Rajindra Hospital Patiala, Punjab. Materials and Methods: A cross-sectional survey using a self-administered pretested questionnaire. The overall knowledge and practices were assessed using sum score of each outcome based on Bloom's cutoff point 60%–80%). 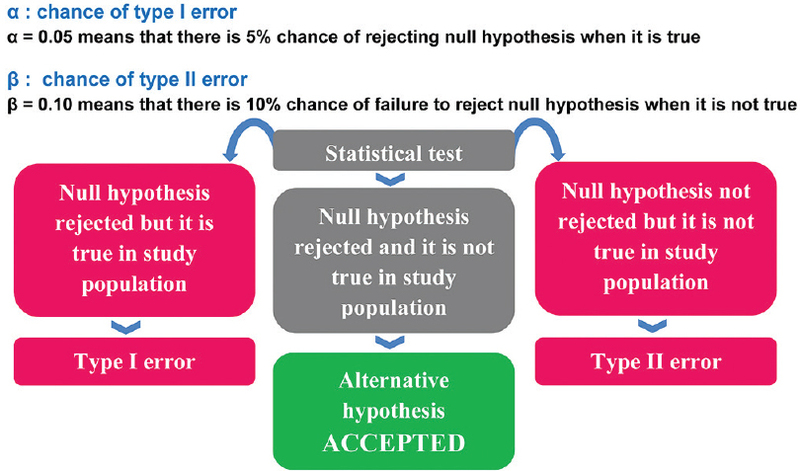 Analysis of variance was used and P < 0.05 was considered statistically significant. Results: Out of 386 residents, government doctors (junior resident/senior resident [JR/SR]) constitute 30% (116) and fresh doctors 70% (270). Government doctors (SRs) have mean age of 40 ± 6.2 years and 13.23 ± 7.6 years of service. JRs from government cadre are comparatively young with 5.4 ± 3.1 years of government service. Overall, there are many gaps in the knowledge and practice of all the residents. Government cadre SRs and JRs have shown slightly better knowledge and practices than fresh residents. It is surprising that majority (63.7%) of experienced government doctor have shown moderate knowledge and 30% of them have poor K-P score with just 5% of them have high score. Similar trend was seen in JR of government cadre. Awareness was even less in fresh JRs and least in fresh SRs. Conclusion: The knowledge and practice is inadequate in all the residents. State health department and medical colleges must collaborate and start reorientation programs and continued medical education. 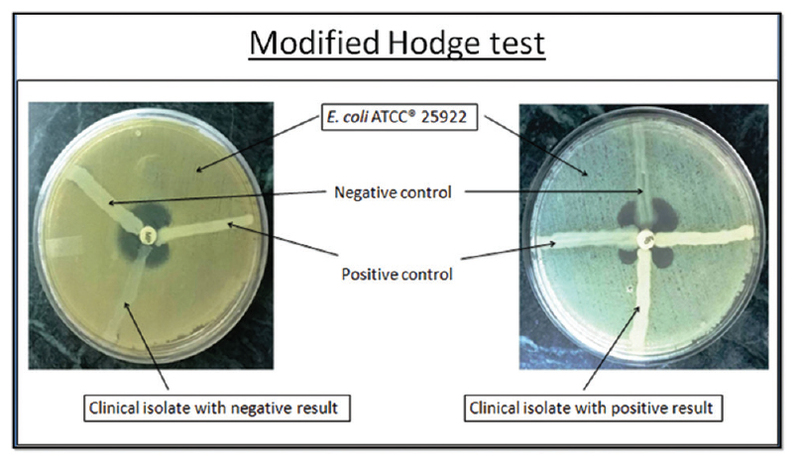 Objective: The aim of this study was to evaluate the efficacy of the modified Hodge test (MHT) and Carba NP test for the detection of carbapenemase production on Gram-negative bacilli (GNB). Materials and Methods: A total of 816 well-characterized GNB isolated from various clinical samples received from both out- and hospitalized patients were included in the study. Out of those, 16.18% (132/816) were carbapenem-resistant on screening test. MHT and Carba NP test were carried out on all these carbapenem-resistant GNB isolates. Results: Out of the 132 isolates screened resistant during the study period, 75% (99/132) were positive for MHT and 86.4% (114/132) showed the presence of carbapenemase by Carba NP test. Conclusion: The advantage of the Carba NP test over MHT is that it is a rapid test where the results can be read in short time and it is easy to perform. The number of detected carbapenemase producers was significantly higher by Carba NP test though this finding can only be validated by molecular analysis of the strains. 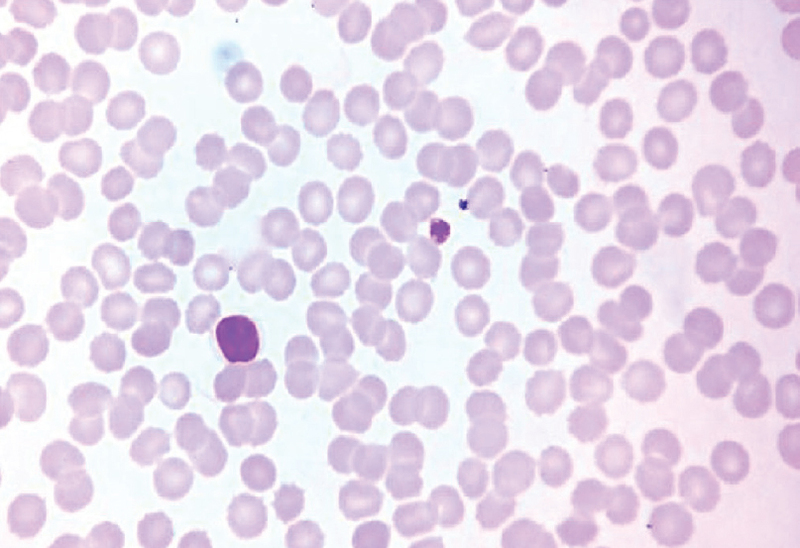 Background: A well-known cause of thrombocytopenia is peripheral platelet destruction in which the circulating platelets are premature and large. Many times a bone marrow examination is conducted to find out the etiology of thrombocytopenia. Assessment of platelet parameters like mean platelet volume (MPV) generated by a hematology analyzer is also believed to be helpful for guiding the clinicians to identify such cases. Aims: This study aims to ascertain whether raised MPV correlates with thrombocytopenia due to hyperdestruction of platelets. Materials and Methods: This was 2 years unicentric prospective observational study which included 100 thrombocytopenic patients. Their clinical diagnosis, platelet counts, and MPV values were recorded. 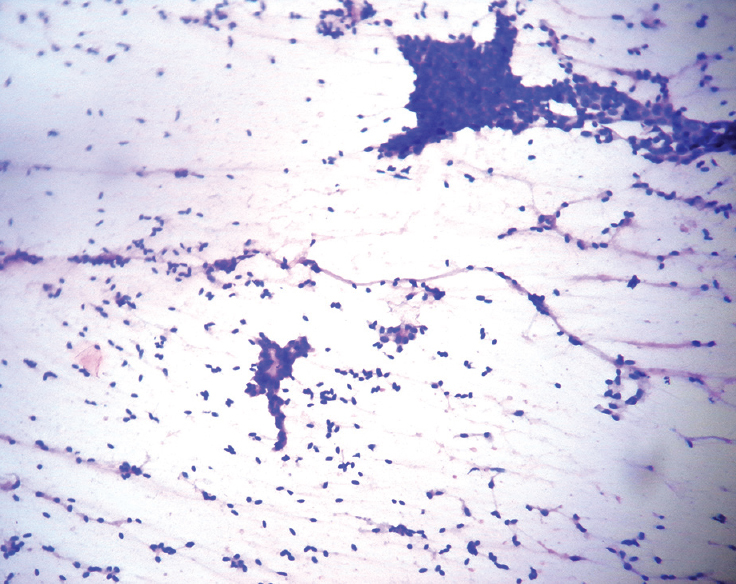 Peripheral blood smears (PBS) were also examined for megaplatelets. Each case was put in Group A (hyperdestructive etiology) or Group B (hypoproductive etiology). Results: Group A had 79 cases out of which 53 had an MPV value more than 10.5 fl. In the rest, although MPV was not prominently raised, the PBS did show megaplatelets. Group B had 21 cases, which were not associated with a high MPV. A receiver operating characteristic curve was plotted, and Youden's index was used to find out a cutoff value for MPV (8.5 fl) which gave the maximum sensitivity and specificity to discriminate thrombocytopenia cases of hyperdestructive etiology from the rest. Conclusion: MPV is an accurate, reliable, and easily obtained platelet parameter which is helpful in diagnosing the basic etiology of thrombocytopenia. It is also a less painful alternative than the bone marrow examination for the patient. Chryseobacterium spp. are Gram-negative, aerobic, nonfermentative, oxidase-positive and catalase-positive nonmotile bacilli that produce yellow to orange pigment. 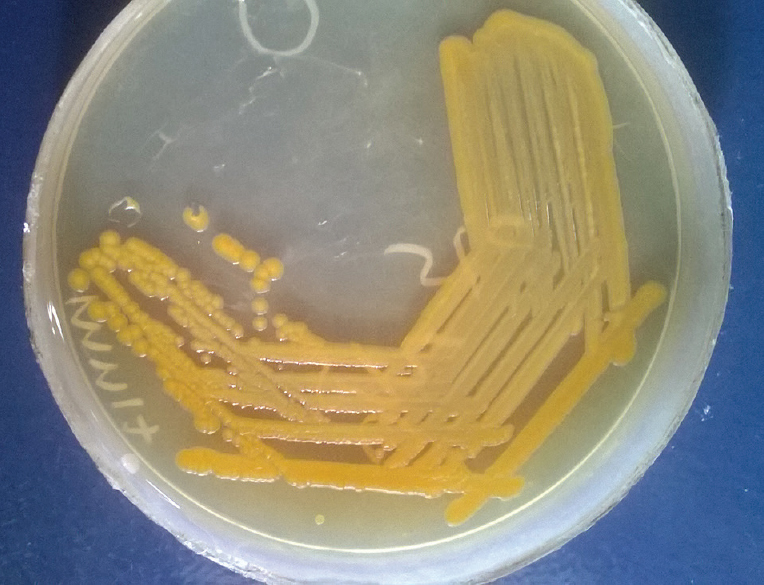 We report three cases of complicated urinary tract infections (UTIs) caused by Chryseobacterium indologenes in patients with obstructive uropathy. 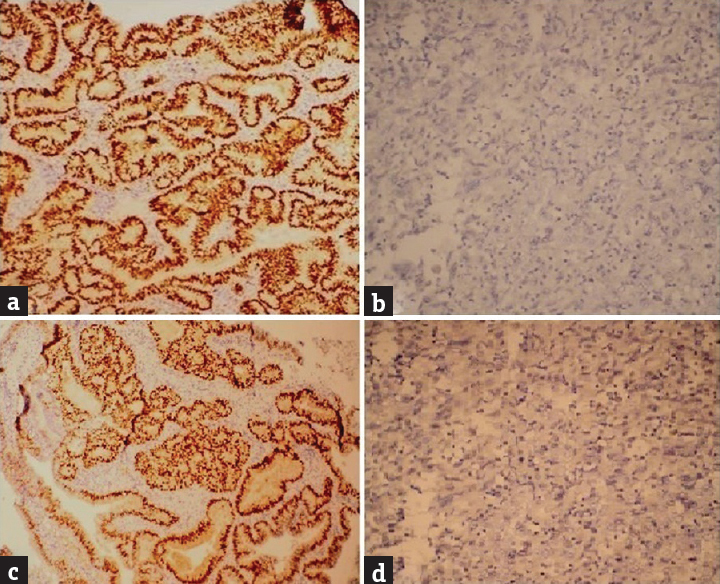 The first case was a known case of diabetes mellitus with right emphysematous pyelonephritis and obstructive uropathy due to prostate enlargement. The patient underwent dialysis for renal failure and subsequently developed UTI by multidrug-resistant C. indologenes. The second case was 72 years old known case of ischemic heart disease. He had acute retention of urine that was relieved after catheterization. He had obstructive uropathy due to transitional cell carcinoma of the bladder and had developed UTI due to C. indologenes. The third case was 38-year-old unmarried female admitted for difficulty in micturition and was catheterized for the same. Obstructive uropathy was due to two fibroids, first fibroid was 9.2 cm × 9.2 cm sized subserosal in the lower segment of the uterus on posterior wall (posterior cervical fibroid) and second fibroid was approximately 1.5 cm × 2.1 cm fundal fibroid; however, the patient developed UTI on the 7th day of catheterization due to C. indologenes. These cases were treated by relieving urinary obstruction and appropriate antibiotic treatment as per antibiotic susceptibility test results. Pregnancy in a rudimentary horn of a unicornuate uterus is rare but ruptured horn has a mortality rate of 5%. We report a case of 26-year-old G4P3 L3 with previous full-term vaginal deliveries, who presented at 12-week gestation with severe abdominal pain. Transvaginal ultrasound imaging was suggestive of ruptured right ectopic pregnancy and patient was taken up for emergency laparotomy. 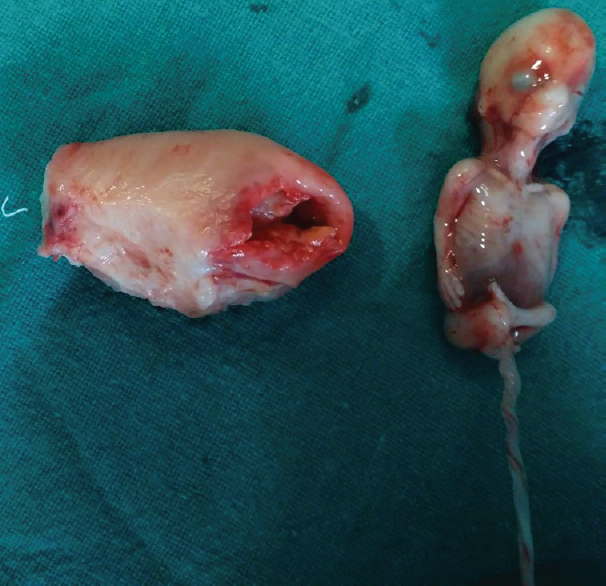 Intraoperatively, 2500 cc hemoperitoneum was present and ruptured right rudimentary horn in the posterolateral part was found, with fetus in the pouch of Douglas, the uterus was of unicornuate type. Excision of ruptured right rudimentary horn along with the right salpingectomy was done. Despite advances in imaging, in developing countries where the prerupture diagnosis is unlikely, a high index of suspicion is crucial in saving mother's life. Lipoma of the uterus is a rare benign tumor, usually developing in postmenopausal woman. Clinical symptoms and physical signs are similar to those found in leiomyomas. Most are postoperative chance finding following hysterectomy for leiomyoma. 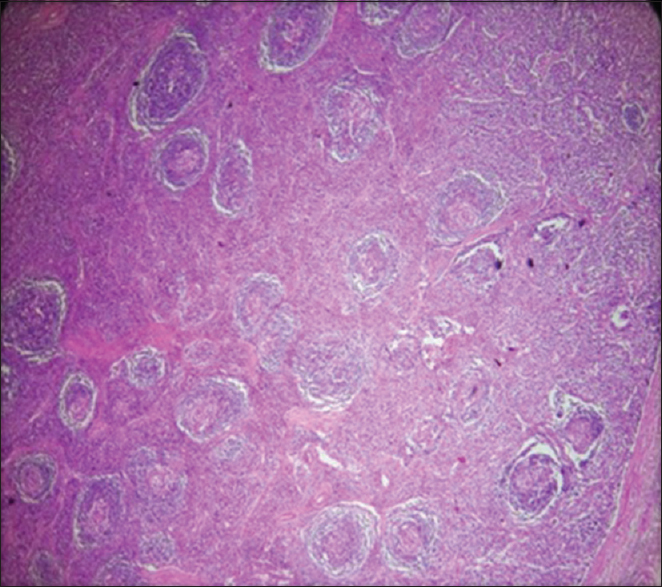 A 50-year-old postmenopausal woman presented with vaginal prolapse. The hysterectomy specimen showed an intramural lipoma of the uterus. 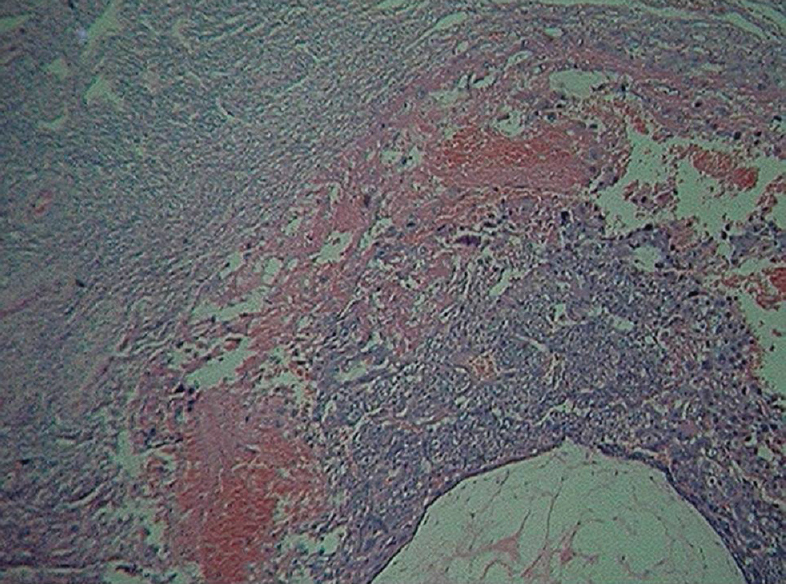 The diagnosis of pure lipoma of the uterus should be made when any smooth muscle if present is confined to the periphery of the tumor composing of mature adipocytes. Our case highlights the importance of this benign but rare entity. The incidence of primary ovarian pregnancy is very rare. The clinical diagnosis of ovarian pregnancy remains challenging. There is no definite clinical, ultrasonographic, or laboratory signs to distinguish it from that of a tubal pregnancy. 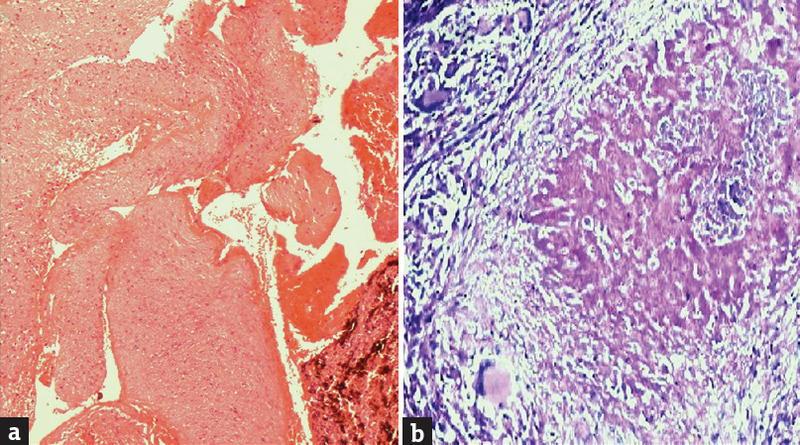 Awareness of the condition and high degree of clinical suspicion and characteristic histopathology is necessary help in arriving at the correct diagnosis. We report one such case in a young female who presented with a complaint of pain abdomen. She had a high serum β-human chorionic gonadotropin levels. She underwent unilateral salpingo-oophorectomy following clinical suspicion of malignancy. Histopathological examination proved it to be a case of ovarian pregnancy. She recovered well in the postoperative period. This is another additional case of ovarian pregnancy to the existing literature highlighting the histopathological findings. Tuberculosis (TB) remains the leading cause of infection-related deaths in adults worldwide. The ocular involvement in TB is extremely rare. The incidence of ocular TB is reported to be 1%–2% of ocular diseases. We report an interesting case of mycobacterial panophthalmitis in an adult male who presented with painful red eye with loss of vision. Bronchogenic cysts are congenital anomaly caused by abnormal bronchial development from the primitive ventral foregut, which arises from cells isolated from the main pulmonary branching when lung bud separates from the primitive gut. 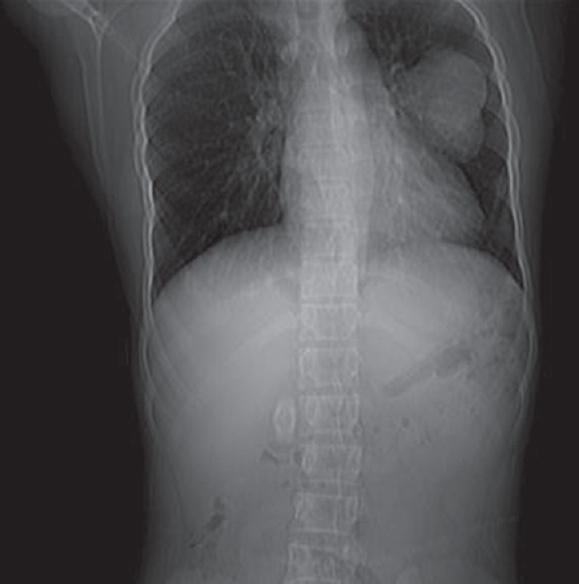 We are reporting a case of 14-year-old boy who presented with nonspecific chest pain and cough.